Nakhon Pathom was once a place of royal and religious significance. But time and the changing geographic landscape altered the province, shifting its appearance as the sea retreated more than 50 km from Thailand's central plains. Still, it is an attractive destination for visitors because the location is convenient (about 50 km from Bangkok) and it houses one of the greatest Buddhist monuments in the region. Since Nakhon Pathom is a short drive from the Thai capital, the area's main sightseeing attractions can be taken in during a quick day-trip. Or, allow a few days for a visit and enjoy all of the draws in the area. Known as the "holiest and first among chedis", Phra Pathom Chedi is the single most important attraction in this ancient enclave. At 118 m, (127 m including the terraces), it is the tallest Buddhist monument in the world, standing higher even than the famous Shwedagon Pagoda in Yangon, Burma. The legend of the chedi is a tragic one: It's said that an astrologer told the ancient King Phya Kong that one day his son would kill him. The king sent his son to live in the forest, where a woman found him and raised him. As a young man, the son, called Phya Pan, entered the service of the King of Ratchaburi, who was a vassal of the king of the neighboring kingdom Nakhon Chaisi. Phya Pan's great wisdom and prudence brought him to the attention of the king, who adopted him. Phya Pan persuaded him to wage war against his feudal lord and, during the ensuing battle, killed his own father. After the victory he followed local custom by marrying the queen, his mother, but then learned the story of his origins. 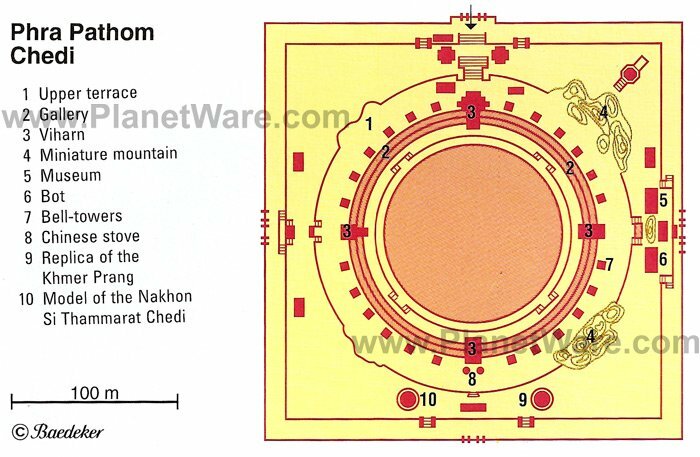 The dagoba he built as an act of atonement was the predecessor of the Phra Pathom Chedi and is today concealed within the larger structure. 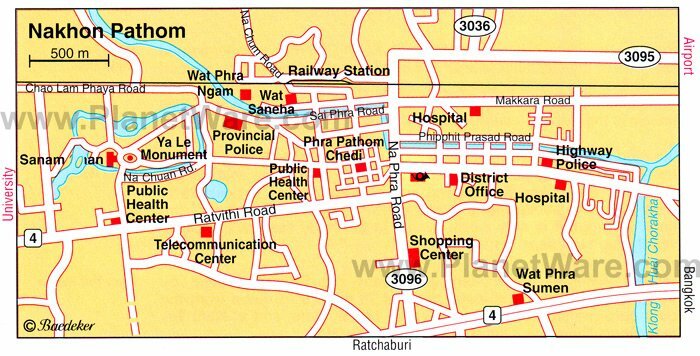 There is a figure in the wiharn on the north side of the precinct that is supposed to be King Phya Kong. The great chedi stands on a circular terrace in the middle of a square park, surrounded by a latticework wall with the main entrance on the north side. The broad flight of steps leading up to the first terrace is edged by stone banisters richly decorated with ornamentation and seven-headed nagas. The bot, one of the buildings on the terrace, holds a very fine Buddha of clear quartzite, overlaid with lacquer and gold leaf. This Dvaravati-style figure shows the Buddha seated in the European pose, "the Buddha of the future". There are three replicas of this statue, all of which used to belong to Nakhon Pathom's Wat Na Phra Men, of which only a few bricks are left. One copy now stands in the Wat Phra Men in Ayutthaya and the other two are in the National Museum in Bangkok. The four wiharns consist of an open lobby and an inner room. A bronze statue of a standing Buddha in the Sukhothai style, known as Phra Ruang Rojanarit, stands in the lobby of the northern wiharn and is a highly revered piece. An inscription on the wall of the wiharn says that the ashes of King Mongkut are interred in the plinth. The groups of figures on display in the wiharn depict the scene where two princesses show their reverence for the newborn Siddhartha (Buddha) as well as one of the most important scenes from the life of the Buddha - how after forty days of fasting the beasts of the jungle brought him food. The old temple museum, containing Mon stucco and stone sculpture, is in the wiharn north of the east entrance. The new museum, the more interesting of the two, dates from 1979 and is by the south steps. Here you'll see stone wheels of the law from Nakhon Pathom's earliest days, as well as coins, statues of Buddha, and everyday objects from Thailand's ancient past. There are also a number of stone and terracotta sculptures and a bas-relief of the Buddha preaching to his first disciples. Every year pilgrims from all over Thailand flock to Nakhon Pathom's grand temple festival in November. The chedi itself is lit up with fairy lights while classical dance drama, shadow plays and other entertainments take place on the terraces. The great square at its foot is turned into an amusement park. In 1910, before he came to the throne, Rama VI built the Sanam Chan Palace in the northwest of the town. Standing in large grounds and connected by a broad avenue to the west gate of the Chedi, the complex has some interesting buildings in a mixture of Thai and European styles. There are a number of ornate halls that were used as theaters and meeting rooms, as well as Phiman Pathom Hall where Rama VI is said to have seen a miraculous vision of Phra Pathom Chedi. The audience chamber has been kept in the Bangkok style. A little shrine contains the Hindu god Ganesha, with the head of an elephant and a human body with many arms. The curious statue of a dog in front of the Chali Mongkol Asana, as the building is called, is probably meant to be Ya Le - the favorite dog of King Rama IV. These buildings now house provincial government offices but still provide an interesting look back at the society that was in this unique part of Thailand. The origins of the temple are unknown, though it is also believed to date back to an ancient period. But this wat is less of interest because of its history, and more so due to what it used for today. Here, monks practice the art of giving sak yant tattoos, a traditional art form in which they use a long stick to tattoo a blessing onto the back. Tourists can visit and get a tattoo, though the monk chooses which to use. These are meant to protect the bearer from evil, and bring them strength and luck. Wat Bang Phra is the site of the annual Sak Yant Festival, when thousands flock to Nakhon Pathom to practice and honor the artform. Many become "possessed" during the festival, and begin acting out the behaviors of animal gods or act erratically as they claim to be moved by spirits. Though less eye-catching than the Phra Pathom Chedi, this whitewashed prang on a square base is nonetheless a significant site, especially for those interested in Buddhist history in Thailand. It is purported to be the oldest Buddhist building in the country, and archaeologists have discovered traces of the foundations and terrace of a sacred building, fragments of friezes decorated with figures, and several images of Buddha nearby. Wat Phra Ngam is known as the temple of magnificent Buddha images, and was the site where a number of artifacts were excavated. Finds included sandstone Buddha images, the Sema Dhama Chakra (a Buddhist Wheel of Virtue that indicated temple boundaries), statues of crouching deer, and both bronze and earthen Buddha images. The temple was built in the Bangkok style by King Chulalongkorn on the foundations of a Dvaravati temple. East and west meet here, where guests can enjoy the many Italian-style gardens in a uniquely Thai setting. It's a perfect place to wander amid nature while retaining some of the comforts of home. (There are hotels, swimming pools, tennis courts, a golf course, and restaurants serving Western, Chinese, and Thai foods.) There are also cultural shows and ceremonies and elephant rides. This makes a nice place to enjoy an afternoon after visiting some of the ancient sites of Nakhon Pathom.